Sta-Rite's modular media filtration is the perfect match for the small inground and aboveground pool markets. Advances in media technology and balanced flow design provide dirt-loading capabilities up to 15 times greater than sand filters of equivalent size. Virtually maintenance-free operation for today's pool owner. The small diameter footprint makes the System 2 filter a perfect fit for new and retrofit installations. Sta-Rite System 2 series filters have a modular media filtration design that is the perfect answer to clean water in both above ground and in ground pools. 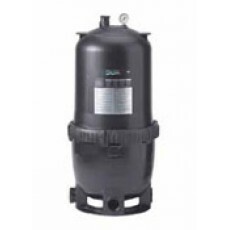 The System 2 advanced media technolgy with shallower pleats and balanced flow design provide maximum dirt-loading capacity up to 15 times greater than sand filters of the same size. The System 2 modular media filter allows for easy do-it-yourself maintenance. Available in sizes from 30 square feet to 300 square feet.